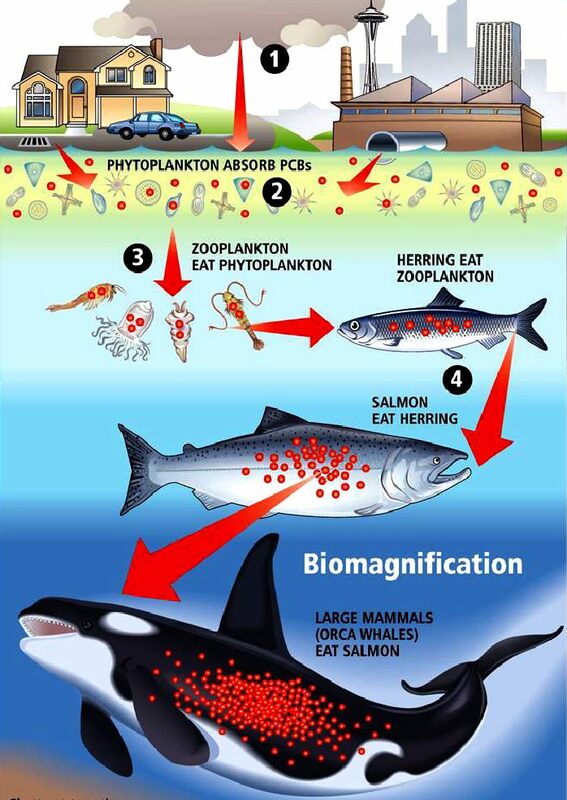 BIOMAGNIFICATION - Phytoplankton absorb PCBs passing the chemical to zooplankton, to herring, then salmon and seals (not shown) and finally to large cetaceans that eat fish and marine mammals. Biological magnification often refers to the process whereby certain substances such as pesticides or heavy metals move up the food chain, work their way into rivers or lakes, and are eaten by aquatic organisms such as fish, which in turn are eaten by large birds, animals or humans. The substances become concentrated in tissues or internal organs as they move up the chain. Bioaccumulants are substances that increase in concentration in living organisms as they take in contaminated air, water, or food because the substances are very slowly metabolized or excreted. An anchovy eats zoo-plankton that have tiny amounts of mercury that the zoo-plankton has picked up from the water throughout the anchovies lifespan. A tuna eats many of these anchovies over its life, accumulating the mercury in each of those anchovies into its body. If the mercury stunts the growth of the anchovies, that tuna is required to eat more little fish to stay alive. Because there are more little fish being eaten, the mercury content is magnified. CARRIER - This is just a small sample of the plastic packaging that you will find in retails stores all over the world (and some fishing rope). A good proportion of this packaging - around 8 millions tons a year, will end up in our oceans, in the gut of the fish we eat, in the stomachs of seabirds and in the intestines of whales and other marine mammals, taking with it POPs in greater concentrations that will end up in the food you eat. Copyright photograph © 22-7-17 Cleaner Ocean Foundation Ltd, all rights reserved. 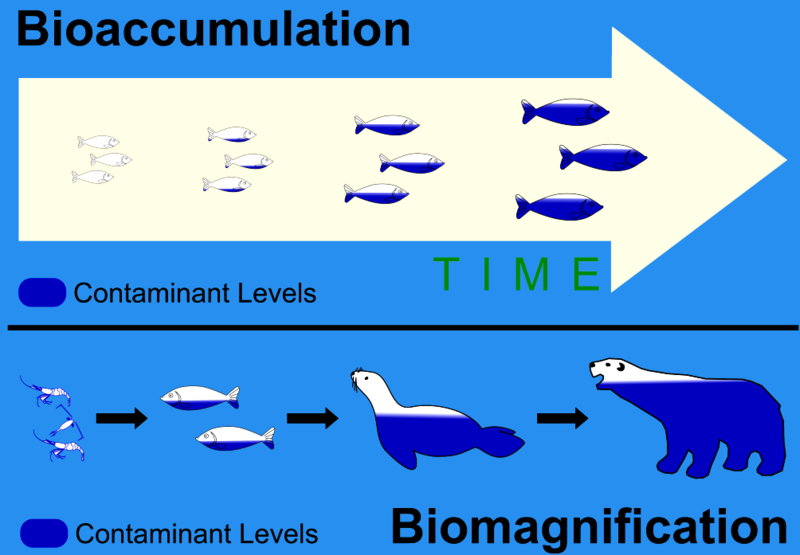 BIOMAGNIFICATION - One of the classic examples of bioaccumulation that resulted in biomagnification occurred with an insecticide called dichlorodiphenyltrichloroethane (DDT). DDT is an insecticide that was sprayed in the ABC farm to help the control of mosquitoes and other insects because the insecticide is cheap and highly effective against the mosquitoes that spread malaria. During rainy day, the rain water washed away the DDT, infiltration of liquid state and leachate of DDT into creeks, where it eventually found its way into lakes and the ocean. The toxic pollutant bioaccumulated within each organism and then biomagnified through the food web to very high levels in predatory birds such as bald eagles, osprey, peregrine falcons and brownpelicans that ate the fish. Levels of DDT were high enough that the birds' eggshells became abnormally thin. As a result, the adult birds broke the shells of their unhatched offspring and the baby birds died. The population of these birds plummeted. Marine fish such as swordfish, shark, and tuna often have bioaccumulated levels of the toxic pollutant from DDT will finally hunted by human beings as protein sources. Pregnant women exposed to the insecticide DDT are much more likely to give birth prematurely, or to full-term but low birth weight babies. Studies in mice have found that DDE blocks the binding of the hormone progesterone to its receptors, and in theory, this could cause both prematurity and low birth weight in humans. DDT concentrations are especially high in human milk. Milk production depends heavily on the use of stored body fat, and this is where DDT tends to stay in our bodies. At concentration above 236 mg DDT per kg of body weight, you'll die. Concentration of 6-10 mg/kg leads to such symptoms as headache, nausea, vomiting and confusion. DDT was sprayed in the United States prior on 1972 to help the control ofmosquitoes and other insects. Because the population of those birds plummeted. DDT was finally banned in the United States in 1972, and since that time there have been dramatic increases in the populations of many predatory birds. 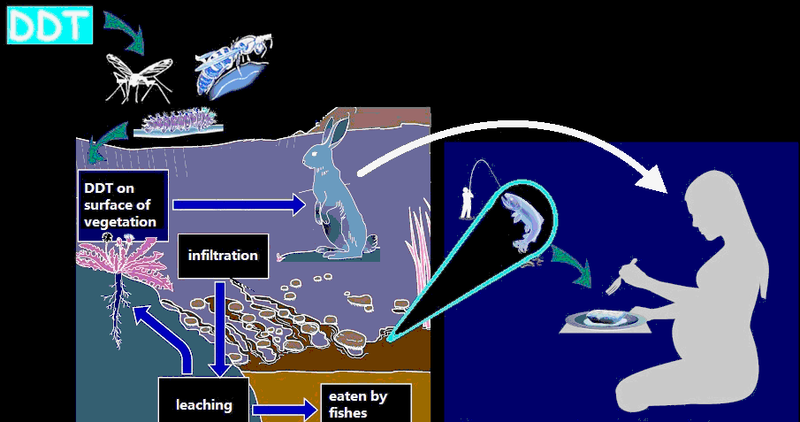 FRESHWATER CHAIN - In this example, mayflies and other insects ingest chemical toxins that the bluegill (bream) eats. A young bluegills' diet consists of rotifers and water fleas. The adult diet consists of aquatic insect larvae (mayflies, caddisflies, dragonflies. The bass also eats insects and smaller fish and is highly sought after by fishing enthusiasts (anglers), commanding a high price in restaurants where protections have been applied due to dwindling stocks. At each stage of this food chain the POPs that the preceding animal has eaten over time, and not eradicated from their system, is passed to the next predator up the line - until man comes into the frame for his relatively concentrated toxic laden meal. ARCTIC CHAIN - In this example zooplankton ingest plastic laden with POPs that fish eat. Then seals eat the fish and polar bears eat the seals. The longer an animal lives the more the build up of the toxins. This is called bioaccumulation. As contaminant levels rise through the food chain as one animal eats another one that is laden with toxins. This is called biomagnification. By way of example, though mercury is only present in small amounts in seawater, it is absorbed by algae (generally as methylmercury). It is efficiently absorbed, but only very slowly excreted by organisms. 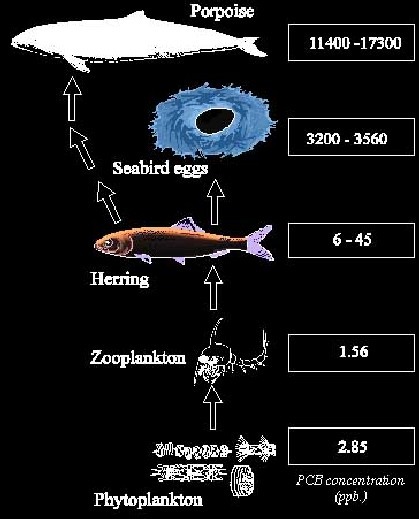 Bioaccumulation and bioconcentration result in buildup in the adipose tissue of successive trophic levels: zooplankton, small nekton, larger fish, etc. Anything which eats these fish also consumes the higher level of mercury the fish have accumulated. This process explains why predatory fish such as swordfish and sharks or birds like osprey and eagles have higher concentrations of mercury in their tissue than could be accounted for by direct exposure alone. For example, herring contains mercury at approximately 0.01 parts per million (ppm) and shark contains mercury at greater than 1 ppm. Today, most agricultural production takes place with the help of chemicals. These chemicals are inorganic substances added into the organism’s metabolism as nutrients, to increase it’s production. However, every organism has a limit up to which it can utilize nutrients. Anything extra just stays there. It gets left over. When these chemicals begin to get accumulated in an organism’s body, it is called bioaccumulation. That is bad enough, isn’t it? Who wants chemicals in their bodies? But it doesn’t stop there. PHYTOPLANKTON - The basis of all life in the ocean is the humble phytoplankton, the beginning of the ocean food chain, where photosynthesis turns light energy into bio energy. On land plants turn light energy into bio energy using the same process. As chemicals are accumulated in an organism, it becomes part of the parts that are generally eaten by the next level or organisms along the food chain. We mentioned that the energy transferred to the next level is always a fraction of what is available in the previous level. This is because the organisms of the previous level uses energy it has. However, extra nutrients (or chemicals) are of no use to the organisms there. Therefore, all of it is transferred to the next level with a fraction of the previous available energy. In total, we now have less energy and a greater proportion of chemicals in the next level. This process of increase in concentration of chemicals or any toxic substance from one trophic level to the next is called biomagnification.